LOL/OMG: OMG! We're No. 2! 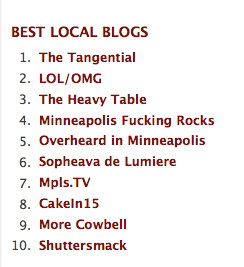 In this week's issue of Vita.mn, LOL/OMG were named the second best local blog, right after our pals over at The Tangential. We would like to thank the 12 people who voted for us, our friends at Vita.mn and whoever shot this photo. We know it has nothing to do with this list, but it's a baby giraffe! Awesome! Congratulations! Love your blog!